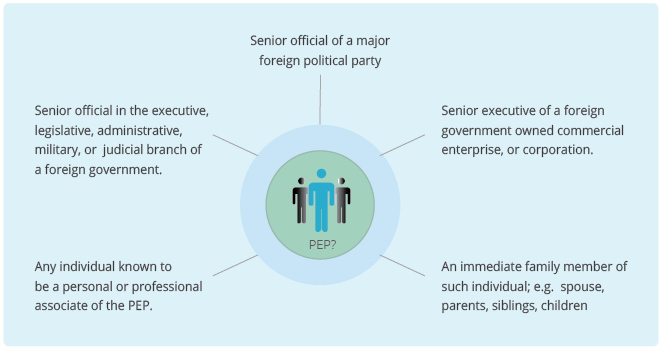 Many PEPs hold positions of influence and as a result carry a greater risk, if their influence is abused for the purpose of money laundering, corruption or bribery. Not only this, but any close business associates or family member of these people will also be deemed as being a risk and therefore could also be added to the PEP list. MLD4 and PEP Checking - Why Is It Important To Check For PEPs? As part of the forthcoming EU 4th Directive on Anti-Money Laundering MLD4, the definition of PEPs will be extended to include domestic PEPs i.e. Irish residents in prominent public functions or in positions with organisations here in Ireland. Previously this was limited to non-domestic individuals. Obliged entities will be required to verify the identity of their customers from an independent third party and take a risk based approach on the levels of due diligence they consider necessary, based on the customers risk level. As part of a risk based approach obliged entities must show they have identified any PEP's on their customer database and provide evidence of on-going monitoring. How We Can Help You Identify PEPs? Vision-net is Ireland's leading provider of risk and due diligence solutions; helping you fulfil compliance and anti-money laundering (AML) obligations with ease, on individuals, corporates and sole-traders. Our PEP Searching platform is the culmination of several years of research into this area and allows for flexible searching and monitoring of your customer base against a global PEP database to deliver reports which meet the highest standard of Due Diligence. If you'd like to know more, simply call our compliance specialists today on Tel: 01 664 1111 and they can advise you further on the AML compliance obligations under MLD4 and our PEP searching solutions.